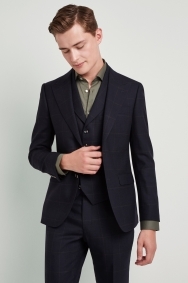 Classic meets on-trend in this sharp suit. 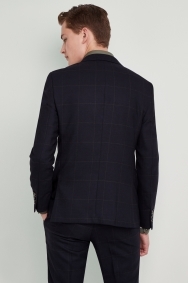 It may have a timeless pattern, but the olive and navy colour combination, curved hem and sharp skinny fit give this jacket an instant update. 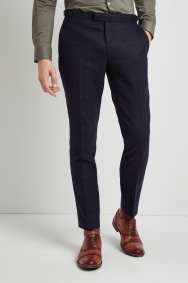 The skinny fit is close fitting and creates a defined outline, while the stretch in the fabric gives you plenty of movement for comfort and to prevent creasing, so you'll always look smart. 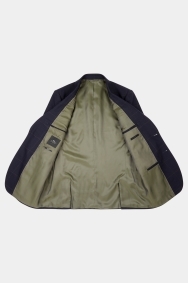 The 100% wool has a smooth finish and there’s a contrasting olive lining for added character. 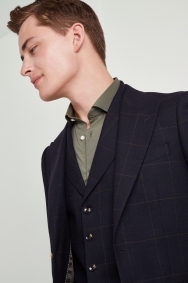 Worn as a 3-piece suit, it just needs a shirt and a smart pair of shoes to complete the look. Be adventurous in a khaki shirt or simply reach for a white or blue one. 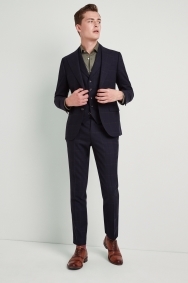 Beautiful suit, very smart, nice pattern and cut. Pretty good. Pretty good. Pretty good. 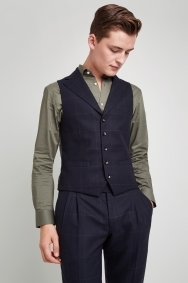 This fitted well but we had to reorder the trousers in a bigger size and hope that they would be the correct length this tine. Compliments galore on the suit and shoes worn to a wedding and comments such as I should have bought those. Superb fit. Great suit with great fit. Stylish, well made, excellent fit.